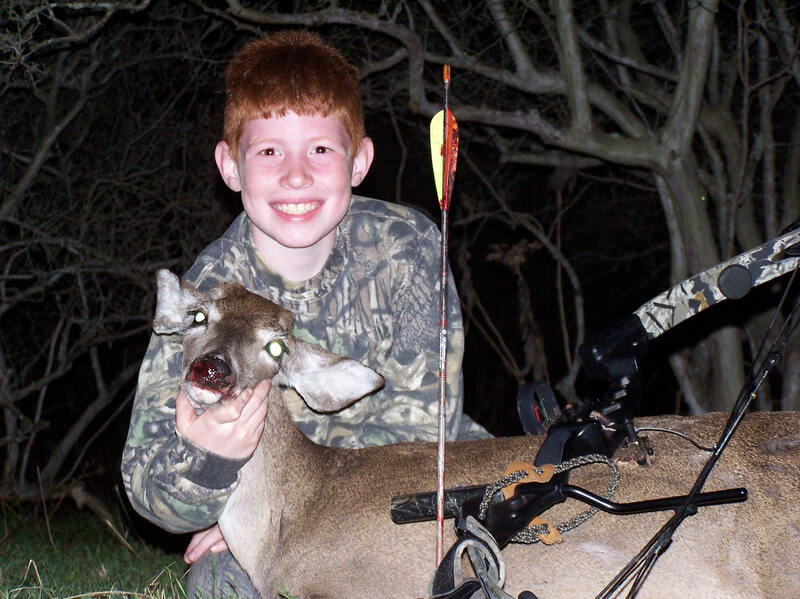 Colby's First Deer & with a bow! It wasn’t to long ago I was holding Colby, my second child, in my arms after he was born. As he grew up I wanted to make sure that he knows about the outdoors, even if he didn’t want to hunt or fish. I remember when Colby was only 18 months old and I took him hunting for the first time. I made a make shift ground blind, out of PVC pipe, plastic sheeting and see through netting, to hide our movement and to help us seeing a deer. It was just before dark when a few old does came into the area and Colby saw his first deer up close, only 15 yards away. Over the past few years he was shooting a little fiberglass limb bow we picked up from a sporting goods store. He started shooting our local 3-D shoots with me and his mom and in no time he was becoming a pretty good shot. 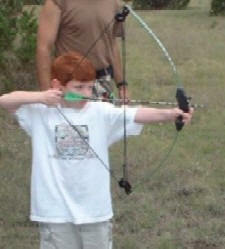 In the spring of 2004, my wife, Tammy, and I decided to get Colby his first “real” bow. We headed to one of the local archery shop (Archery Country in Austin, Texas) where we found him a Browning Micro Midas III. We couldn’t go wrong with this bow because of the wide range of draw lengths and draw weights. Colby got to try it out and during the course of the visit at the store, the bow was being set up right in front of him. He had no clue he was getting a new bow for 3-D tournaments and to hunt with. After an hour or so the bow was set up and tuned. We set it down and I asked Colby if he wanted the bow. It was rather comical because even though we assured him we were not joking he just didn’t think that me and his mom were serious about buying him a “real” bow. Colby loves shooting with us at the local 3-D shoots. It didn’t take Colby long before he was accustom to his new bow. He began to excel in his age bracket. Actually, he placed in the top 3 at all but one or two shoots. By September, I felt Colby was capable of making a good shot on an animal. I just couldn’t wait to be able to sit with my son while he took his first animal with his bow. I told him I would ask our Uncle Leo, if he would ask one of his friends if we could hunt pigs on one of their South Texas ranch. We finished out the 3-D season and we didn’t get to Laredo before deer season opened. We continued to talk about going to Laredo, as soon as possible, so Colby can shoot a couple of feral pigs. During the deer season Colby didn’t show much interest in shooting a deer, with his bow, until the last part of the season. Actually, it was the week before the last weekend when Colby asked if he could shoot a deer with his bow. I didn’t see why not, so we headed out to the lease for Colby’s first bow hunt. We the New Year weekend camping out at our lease. New Years morning Colby and I headed to the ground blind where he would be hunting from. We left early and got settled in the blind. The sun must have been tired and didn’t want to rise, because it seemed like the first glimpse of daylight took forever. I was excited to be hunting with my kid. Finally, it was light enough to make out things beyond the window of the blind. We had seen a large figure which appeared to be a deer. It was a yearling that was 15 yards away. We watched her mingle as she ate. I finally asked Colby if he wanted to shoot her. I could see his eyes widen and a smile merge on his face, when his head nodding in a yes motion. Colby sat on my knee and he nocked his arrow. He waited until the young doe was broadside and said, “Now is a good time right?” I said, “Yes.” Colby carefully drew his bow back and the deer stepped left slightly. I told him he could still shoot. Colby held that string for ever…then I heard the click of the release and the string slamming forward. The arrow was gone! I focused on the deer and I could see the arrow had missed its intended target by at least two feet over her back. Colby let out a sigh of disbelief. I told him to sit still and stay quiet. The deer only took three steps to the left, but was behind a small mesquite tree. She wondered back into the shooting lane and he got ready for a second shot. The little doe appeared to have her belly full and calmly walked off. I was a little disappointed for Colby, but it was a learning experience for him at the same time. Later at camp we were going over the hunt. After discussing what happened and reviewing the video of the hunt, his mom and I realized Colby never shot from a sitting position. So to plan B…Colby practiced shooting off of a 5-gallon bucket from 15 yards. It took several shots for him to figure out the new shooting style, but when he did he was right on the mark! The next day we hunted but nothing came to our set up and he was pretty bummed out. We had to end our hunt so we up packed up all of our camping and hunting gear and reluctantly headed back the city life. The whole way home we talked about our weekend and we were making plans to do it again the following weekend. The next weekend was fast approaching and we couldn’t wait until Saturday. Saturday morning rolled around and we were off the lease. Colby and I headed to different ground blind. We call it “the blind on the hill”. I had been seeing al lot of deer at “the blind on the hill” and shot two from there earlier in the season. Around 9:00am we saw a couple of deer but they were nervous and didn’t stay around long. Shortly after they left we saw two different coyotes and figured out why they were on the move. We didn’t expect to see anything in this area the rest of the morning so we loaded our things and headed to camp area. We set up camp, had a good country breakfast and talked about hunting again during the evening. Colby wanted to hunt the “blind on the hill” again. I don’t think it was because I had been seeing deer there. It was more like we would be using the four-wheeler to head up to the stand. I also think he liked the fact that he could actually stand up and shoot from that portable ground blind that I had set up there. It was about 3:15 pm and we headed out to our evening hunting spot. As we ventured out on the 2 mile drive we saw at least 30 Blackbuck antelope in one pasture, some Axis deer in another and of course the cows. We checked a hog trap for any pigs and browsed the creek area where hogs are always coming to wallow and drink from. There was no new sign of pigs. We made it to our “sweet spot” by around 4:00 pm and began to make ourselves comfortable. We weren’t fully settled in yet when the first deer walk by a large brush pile. I had scattered some corn at 10 yards and 15 yards so Colby could have a yardage marker, know what pin to use without having to ask and to get the deer to relax if they came in to the area. By 4:45 pm we had several deer including a nice 9 pointer around us. They were making their way in when something spooked them. They all took off. I could head Colby say, “That’s okay they will be back.” Sure enough within five minutes one little nub buck was walking back. I asked Colby if he wanted to shoot him, if he got close enough. The answer was, “Yes!” Colby stood up and moved towards the back of the blind, so he could have plenty room to draw his bow. The little buck moved closer and closer until he was 10 yards away. Colby waited for the broadside shot. The buck moved and presented his right side to Colby. He drew his bow and the buck spooked. The small buck ran about five yards, looked around for a few minutes then headed back into the shooting lane. The buck relaxed and stayed about 15 yards away as he nibbled on some of the corn I had tossed onto the ground. Colby was ready to try to deliver a fatal shot to his first buck. Everything was working to his benefit. Colby was focused! He put his game face on and waited for buck to present the best shot angle. He drew his bow, aimed and released. I was watching Colby and the deer. I knew Colby’s form and release was good but I didn’t see the arrow hitting the deer. It was a clean miss! The buck ran off, but he didn’t run off to far. We could still see him 40 yards out through some small trees. Colby sat down again bummed out for missing another deer, Colby then stated he didn’t want to try again. I talked to him about my missing all my deer when I first bow hunted and with every miss I learned something new. I learned to be patient, I learned to follow through, and I learned to focus on one spot not the whole deer, and so on. He listened and agreed to try again if the deer comes back. At around 4:55 pm the nub bucks comes back. He wasn’t wasting any time coming in this time. He walks straight to the same spot he was and begins to eat again. Colby gets ready and says, “Maybe I should let him grow up and get antlers.” I got tickled at that statement…sounds like something dad has said before. I told him if that is what he wanted to do then that was fine, but I did tell him that the little buck was a good first deer for anyone that is 8 years old. Colby decided to go for it again. He gets in position. He watched the deer’s movements, actions, reactions, pausing when the deer looks towards our blind. When the deer moves his head to feed Colby slowly moved and settled into a good shooting position. I told Colby to wait until the deer raised his head to shoot, so he will not duck the string. The deer dropped his head to eat. Colby drew his bow and I began to coach him the rest of the way. I made a kissing sound for the deer to raise his head. I told Colby to pick a spot behind the point of the leg. 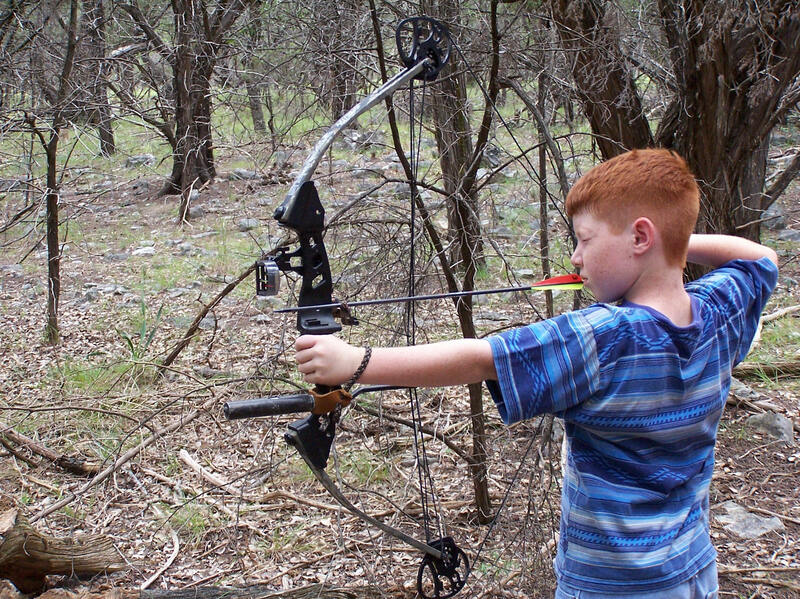 Let the pin float until it gets to the spot he wants the arrow to hit, then slowly squeeze the release and follow through by keeping the bow out like you are still going to shoot. Just as I finished talked I hear the release snap, the string slap forward and the arrow fly towards the chest of its intended target. The arrow slams into the deer and he falls in his tracks! I was shocked! I was waiting to see which way he was going to run. I look over at Colby and he is all smiles! I hug him and congratulate him for his first deer. We give the deer a few minutes until he is totally breathless before going to see this magnificent creature. We got out of the blind to admire Colby’s first bow hunting harvest. The arrow entered the slightly quartering away deer at the 3rd to the last rib. It traveled forward striking the liver, going through the diaphragm, into one lung and then into the spine. The young deer expired quickly. We loaded Colby’s deer on the four-wheeler and headed towards camp. We still had plenty of light and actually had to sit under a large oak tree until dark, so we didn’t disturb Tammy’s hunting. We would have to drive right next to her blind to head to camp. We watched other deer and some Blackbuck antelope from the tree we were perched under. Colby wanted to call his Mom on the radio and tell her his success story. I could tell she was very happy for Colby and wanted to check out his deer. It wasn’t long after Colby talked to Tammy and she radioed us and told us she was going to end her hunt. As we headed towards her she was walking towards the dirt road close to where her stand is located. I could see she was smiling as we pulled up and of course Colby was grinning from ear to ear. We met up and he told his story. We headed to camp and to the skinning tree. Once we were finished cleaning the deer we cooked up a good meal, gathered around the camp fire relaxed talked about hunting and whatever else came up until it was time to turn in for the night. This is something I will never forget and am thrilled that I was able to be with my son when he harvested his first deer. Next time I’ll have it on video!